INFINITE ARRANGEMENTS! Two possible arrangements are shown above. 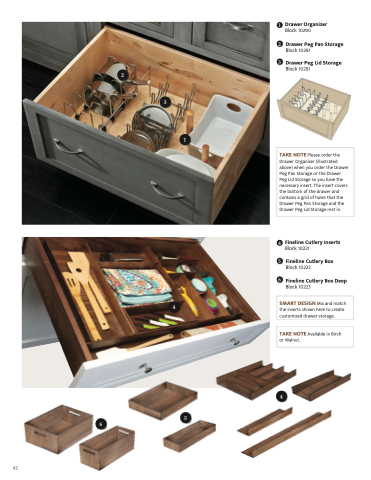 TAKE NOTE Please order the Drawer Organizer (illustrated above) when you order the Drawer Peg Pan Storage or the Drawer Peg Lid Storage so you have the necessary insert. The insert covers the bottom of the drawer and contains a grid of holes that the Drawer Peg Pan Storage and the Drawer Peg Lid Storage rest in.